I had never been in a Starbucks before. I couldn't grasp the concept of paying big bucks for coffee, plus the fact that I never seemed to have the big bucks anyway. Today was different. I was going to treat myself, for a change. After going through and surviving a nasty divorce, I deserved it! Once inside, I noticed I was the only customer. I was intrigued by the menu; too many choices! I struck up a conversation with one of the baristas, asking for a recommendation. Finally settling on a tall, skinny vanilla latte, I let my mind wander with the thoughts of what I needed to buy to furnish my new apartment. I grabbed my cup and spun around to go. That's when it happened. Lost in my thoughts, I didn't hear anyone else come in. This well-dressed, tall, handsome man was now wearing most of my steaming hot latte! Oh my God! Panic abruptly filled my soul as I watched him pulling his shirt away from his body to keep it from burning. I noticed the line of liquid from his starched white dress shirt down to the puddle that lay around his shoes. At first, I couldn’t move as my brain slowly absorbed what I was seeing before me. Then it hit me; I had injured this man! I needed to do something, anything, so I grabbed as many napkins as I could and dropped to the floor, wiping his shoes, pathetically apologizing, asking if he was all right and wondering if my new single again life was about to end abruptly. I had visions of lawsuits, medical bills and dry cleaning and wondered if either one of us would ever recover from this moment. I was babbling on, but my brain wasn’t cooperating. He was smiling at me, and then began laughing. He reached his hand down to help me stand, and assured me that he was fine. I’ll say. If not for the ugly coffee stains, he was a fine specimen for sure! My smile must have looked pathetic and I again began to spout apologies. Offering reassurances, he helped me find a seat and made the comment that whatever it was I spilled on him smelled pretty good. I nervously told him what it was, and he left. I was still trembling as I reached for my purse to locate one of my business cards, hoping I would be able to take care of this mess. Uh oh, he was heading back my way! He handed me a fresh, tall, skinny, vanilla latte. I was blown away by his kindness and gentleness. Now that my head was clear I told him I would be willing to take care of any medical bills or dry cleaning or anything that would make this better, and offered my business card. We chatted for a while, and I learned that he was in the midst of a divorce himself, and that we had a lot in common. Once again he reassured me he was okay; he took my card and left. A week later, I received an email from him. He wanted to meet at a local restaurant for dinner. I was still nervous, thinking someone may have talked him into pressing charges against me. He revealed that he had no intention of suing me, that the coffee didn’t burn much because he was able to pull his shirt away quickly, and the stained clothes were no big deal. He was more interested in me, and as we chatted the evening away, it became clear that we did have a lot in common. We both began to feel that our “accident” was no accident. 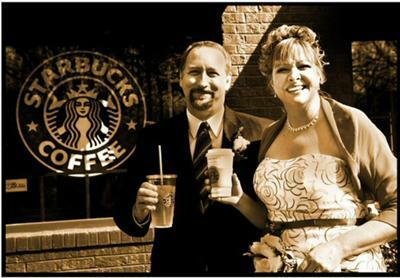 A year later we were married in that very same Starbucks. Family and friends from all over the country, as well as local news crews came to witness our vows as we remembered the fiasco that had taken place a year prior. Every time I drink a tall, skinny vanilla latte, I remember the most romantic moment of my life.